It’s a busy day of errand running so before I head out the door, I need a little snack to power me through. So I made a delicious dip made from simple whole ingredients I always have on hand. 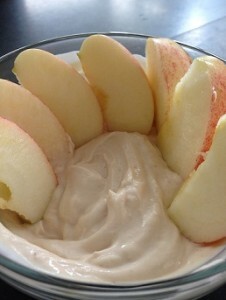 In a bowl combine the yogurt, almond butter, and sweetener of your choice and mix until thoroughly combined. Add in a few dashes of cinnamon and continue mixing. Slice an apple or fruit of your choice and begin the dunk fest! This dip is fantastic because it’s low in sugar, contains probiotics as well as protein from the Greek yogurt, you get healthy fats from the almond butter, and the cinnamon helps stabilize your blood sugar. Nutrition Facts reflect the dip alone and does not include the fruit.